In the 60’s and 70’s harbour areas and their waterfronts were not much appreciated in many european cities. They were neglected and considered problematic. E.g. Hamburg, Genova, Kopenhagen, Amsterdam. Quite often they were cut off from the city’s most frequented neighborhoods by vast infrastructural bodies and douane barriers. Harbour areas have a strong characteristic identity and atmosphere; the traces of labour and usage; the proximity to the water; the large spaces of bassins and long stretched quays. First, a valid strategy for conversion of these areas into new neighborhoods and public space must aim for preserving its unique character and make it accessible and usable. Secondly ‘thinking blue’ means to further improve the waterquality in the bassins of Nørdhavnen, since it is part of that public space and should as well be suited for a lot of activities. 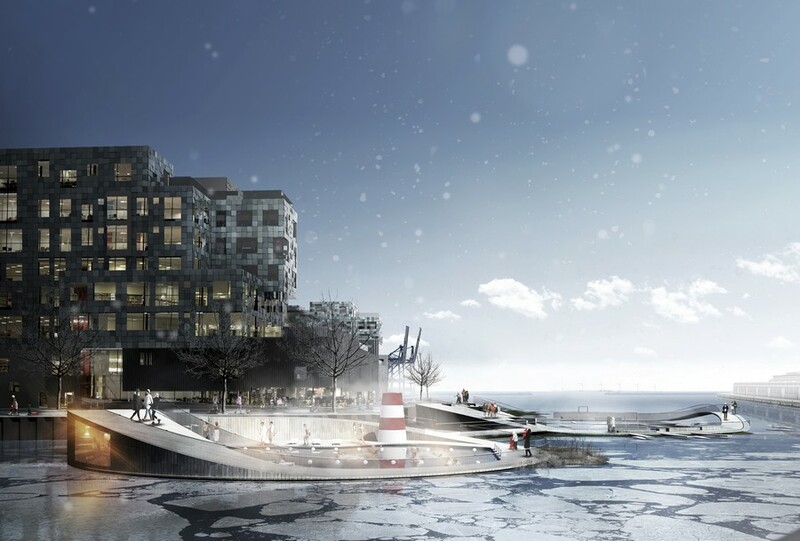 In Nordhavn there will be a lot of public space along the water: calculating an average width of 20m it totals more than 25ha of quay space and more than 12km of quay length: it roughly doubles the accessible quay-length of Copenhagen centre. Succesful public space does not need a lot of design with a capital ‘D’. It is mostly designed / defined by the combined presence of public functions and public connections. This is why we cannot only ‘design the edge’ – a strategy for public space is integrated with considerations concerning public network and functions. – add squares, parks and venues: like in the existing urban fabric there is a number of special places to create addresses and destinations in the new area. They are combined with public program. – add an extra layer of floating public program attached to the quays that can vary in position over time or according to season – the usage of the quays can be programmed or curated. A catalogue of specially furnished and equipped pontoons or hopper-barges allows to install public functions and to help activating the quays without imposing a fixed design. These are an important element in order to guarantee the usage of the quays throughout the year. With the winter season being quite long in DK, these barges can be maintained and converted to covered spaces in its own ‘barger-dock’. Thus public functions can be provided along the quays all year long. February 4, 2010 in Copenhagen.